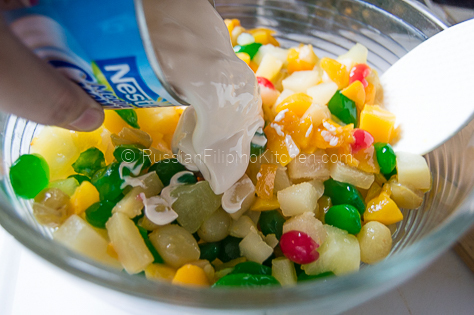 The traditional version of fruit salad in the Philippines consists mostly of canned fruits and sometimes mixed with fresh fruits like apples or mangoes mixed with cream, some cheese, and condensed milk. I am actually wondering about this at first because my country is located in the tropics where a variety of fresh fruits are available all year round. Why canned fruits? I’m guessing more people find it convenient using canned fruits preserved in syrup. No cutting, peeling, and mess to deal with. 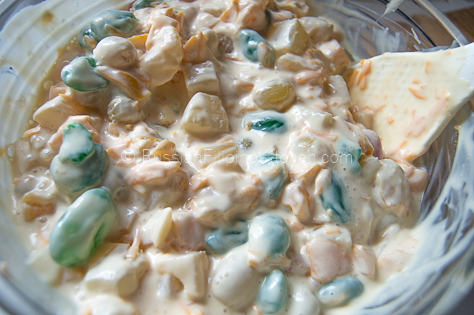 You just dump everything in a bowl, mix thoroughly, and chill in the refrigerator for an hour or so till it’s ready for serving and you’re done. 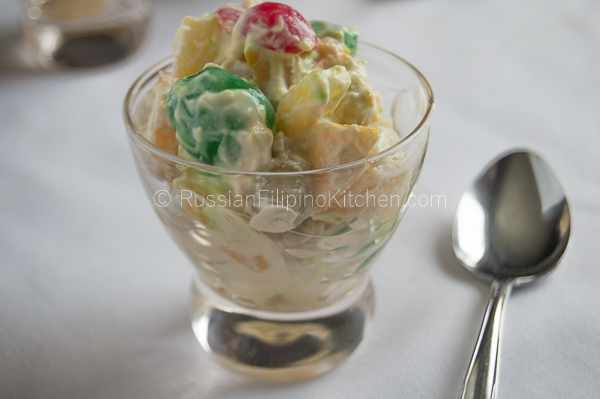 This fruit salad recipe is very easy to put together. I recommend refrigerating the mixture for at least an hour to allow the flavor to blend together. 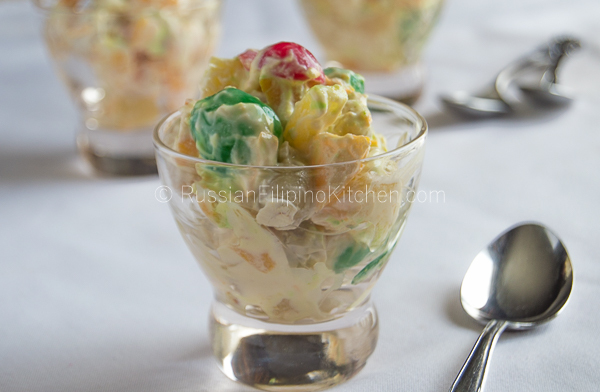 I prefer my fruit salad in the freezer so when it’s time to serve they’ll look and taste like ice cream. Yum! 1. In a large colander, drain fruit cocktail, pineapple tidbits (if you use pineapple chunks, you can slice them into smaller pieces), and sugar palm fruit. Let stand in the sink for 5 minutes to further drain the liquid. 2. Meanwhile, shred about a cup of cheddar cheese if you have a block of cheese. Otherwise, skip if you have pre-shredded cheese on hand. 3. Place drained fruits in a large mixing bowl. 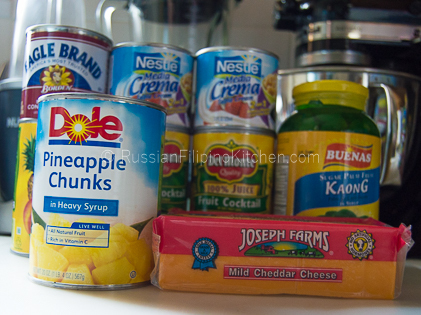 Pour table cream, about half a cup of condensed milk, and 1 cup shredded cheese. 4. Mix together using a spatula or spoon until well-combined. 5. 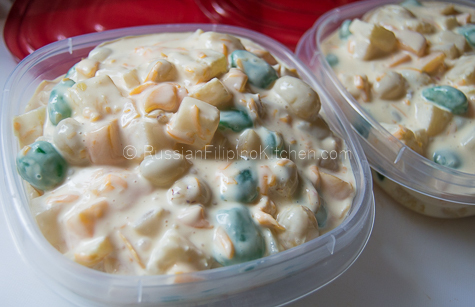 Transfer to a container with lid and refrigerate/freeze for at least an hour. 6. Serve cold. 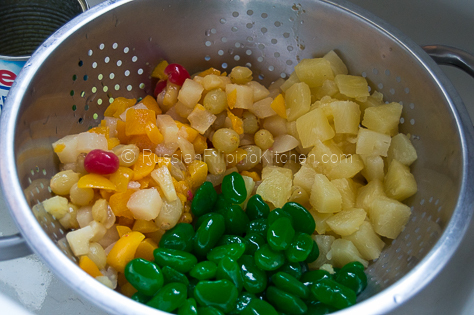 In a large colander, drain fruit cocktail, pineapple tidbits (if you use pineapple chunks, you can slice them into smaller pieces), and sugar palm fruit. Let stand in the sink for 5 minutes to further drain the liquid. 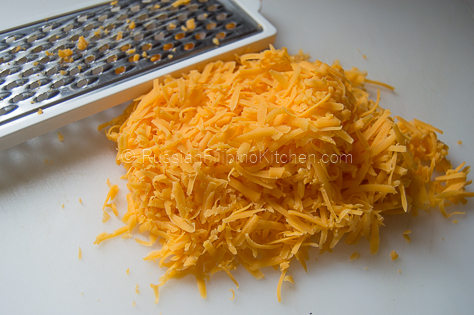 Meanwhile, shred about a cup of cheddar cheese if you have a block of cheese. Otherwise, skip if you have pre-shredded cheese on hand. Place drained fruits in a large mixing bowl. 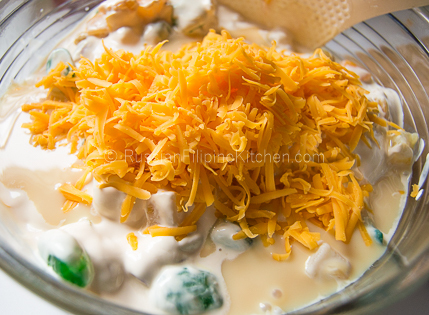 Pour table cream, about half a cup of condensed milk, and 1 cup shredded cheese. 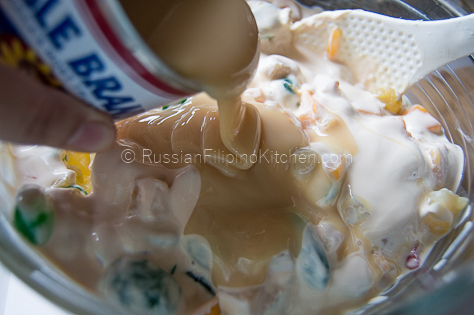 Mix together using a spatula or spoon until well-combined. Transfer to a container with lid and refrigerate/freeze for at least an hour. Uy, Bisaya pud diay ka Sir Joefrey…apir ta ani hehehe! Anyway, salamat sa pagbisita permi sa akong blog. Lipay kaayo ko nga daghan natabangan sa akong mga recipes. Please share the word sa imong mga kaila! God bless pud! Oo oi mam Mia bisaya kaayo ….apir ta oi hehehe! anyway, updated ko sa imo Blog like na gani naku sa akoa FB ug sa akoa e-mail para updated ko kung naa ka bag-o menu..salamat kaayo mam Mia nakatabang jud imuha mga menu ako na gani gi pang try luto Yummy oi nahan kaayo ko..God more Blessing to you !